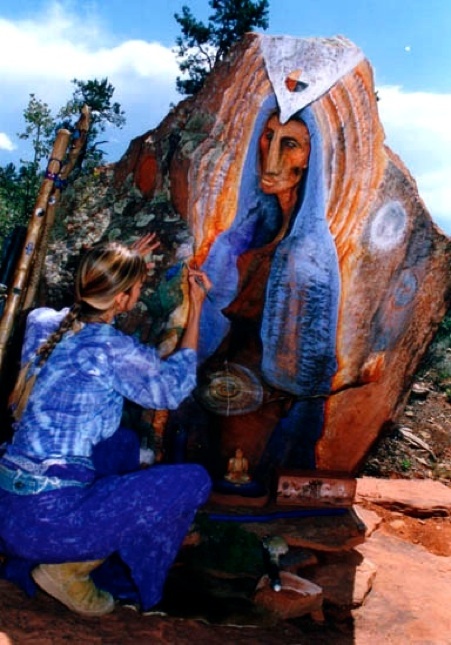 This painting I did on a rock in the National Forest of Sedona Arizona at the Southeastern end of a Native American Medicine wheel. 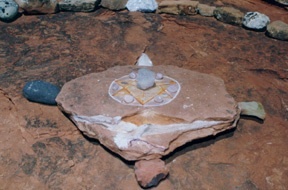 I was Praying near the medicine wheel at the altar that consisted of a very large rock. It was one of those hard days where I found myself huddled and humbled in tears looking for my center out in nature where I feel most connected, something that I have done since I am a little girl. Oh Mother Goddess I see you clear coming through with such gentleness here. She’s changed me for life She showed me a new way. painting my gift to Her children and the Earth. using my voice to midwife Her birth. Her Blue Corn is the promise of life. I knew I would get there, I sang her sweet tune. Sweet passions Fire creates our New Earth Higher. She’s not for sale, my gift to the Earth. the death of my ego and rebirth. She healed my mind full of illusions. Her Love shines forth, clearing all delusions. Holding space for the Feminine in balance. Many of us feel a lack and are seeking within ourselves the compassionate aspect of the nurturing mother. Even if our human mother appeared to do the best she could, we still are often left with a feeling of something is missing. This feeling of separation happens at birth and seeking our connection with our Mother Earth and the natural world is what heals this. The Divine Mother God in the feminine form abides in the heart of every being and in all Universes without end. She is the divine creatrix who has manifested forms of consciousness in union with the eternal Infinite Supreme Being, “God the Father.” In truth, speaking of them as two creates the illusion of separateness, these two, are not two. Rather, they are inseparably bound for all Eternity as One. The Altars Mother Goddess and Father God Tree of Life hold a sacred balance of the Masculine and Feminine united and One. The Medicine Wheel is a circle representing life, truly an infinite symbol; its four corners are seen as the cardinal directions, the elements of earth, wind, fire, and water, four races and stages of life. 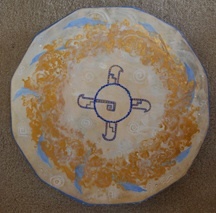 It is seen as a symbol of all life’s cycles, honouring each cycle of life, each step a pathway to gather new understanding and wisdom.